Reverend Sigi Casey is an ordained minister since 1993 and has been teaching Metaphysics since 1991 at Christ’s Universal Church on Merritt Island, FL. She was also Co-Pastor of Universal Path Center (UPC) in Merritt Island which closed in December, 2009. Rev. Sigi has been practicing Reiki since 1985 and earned her Reiki Master in 1995. 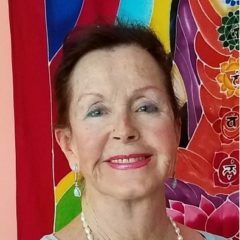 She is also skilled in Kriya Yoga and Meditation and has been teaching others for over 35 years. Rev. Sigi continues to serve the community by leading the Sunshine Healing Circle at Universal Energy Massage, on Monday’s at 12:00 pm. Rev. Sigi guides the meditation and prayer circle that consists of mostly Reiki Masters and Reiki Practitioners. The group sends Prayers and Reiki Healing Energy out to anyone who requests it for themselves, family, friends or community. Rev. Sigi invites you to join the circle and learn for yourself how to calm your mind, trust in prayer and become a magnet for prosperity and abundance, all people are welcome. Doors are locked at 11:30 pm due to the meditation aspect of the circle. Cost: A suggested LOVE offering of a least $5 is greatly appreciated but not required.